I happened to see someone’s happy birthday post on Facebook that featured a remarkable Toyota Crown cake. This thing was the Finnegan’s Wake of automotive cakes. I’m pretty sure I’ve never seen a better car-cake. 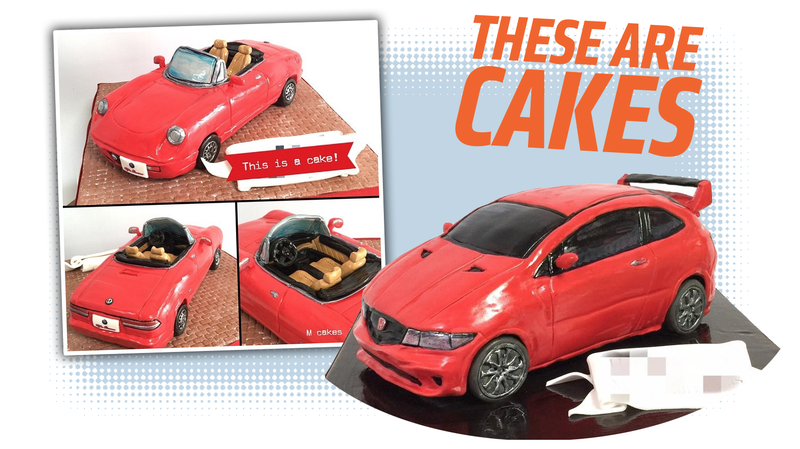 Curious, I found out who made it, and, oh boy, if car-cakes are your thing, put down a dropcloth to catch all of the blown-mind chunks you’re about to deal with. The cakes are from a bakery in Japan called MCakes, run by a baker/cake artist named Megumi Suzuki. She makes all kinds of cakes, but I’m just interested in the automotive ones. In that arena, I’m pretty sure she’s the undisputed Queen of the automotive cake. Z-Car/Fairlady cakes. What flavor would a cake like this be? Motor oil? Straight-6 flavor? Pixelating the frosting license plate of a cake car is sort of mind-scrambling. Jeep cake! You can even tell it’s a JK. She even made the badge! That’s either an Alphard or a Vellfire. Anyway, I have no idea if these can be shipped halfway across the world, but if so, I think I’d like to see about a nice yellow Beetle cake for my next birthday/parole/wake. What flavor is black frosting? Tar or oil?